(Blooming Prairie, MN March 5, 2018) – After seeing and experiencing the value firsthand, Minimizer has once again agreed to serve as the series sponsor for the Bandit Big Rig Series. "It is a no-brainer," Minimizer Director of Marketing Steve Hansen said. "The Bandits are a huge spectacle and we're along for the ride." Citing the branding, advertising and R&D opportunities, Hansen said Minimizer is excited to be a part of something fun. "The Bandits draw kids and adults, young and old. It's a diverse crowd, and practically every single person is connected to the heavy duty trucking industry in some way," Hansen said. Last year, the Bandits kicked off their inaugural season by running races in eight different states. This year, only two of those tracks remain on the schedule, as the Bandits hope to introduce their event to countless new fans. "Unfortunately, we can't just scratch out ‘2017' on last year's schedule and replace it with ‘2018,'" Bandit General Manager Jason Johnson said. "We're a grassroots start-up trying to create new fans." "We were really excited to see new tracks on the 2018 schedule," Hansen said. "It gets our products in front of countless new eyeballs, which is what we want. And we can appreciate the Bandits goal. We've been in business awhile now, but a few decades ago, we were that start-up looking to build our brand." 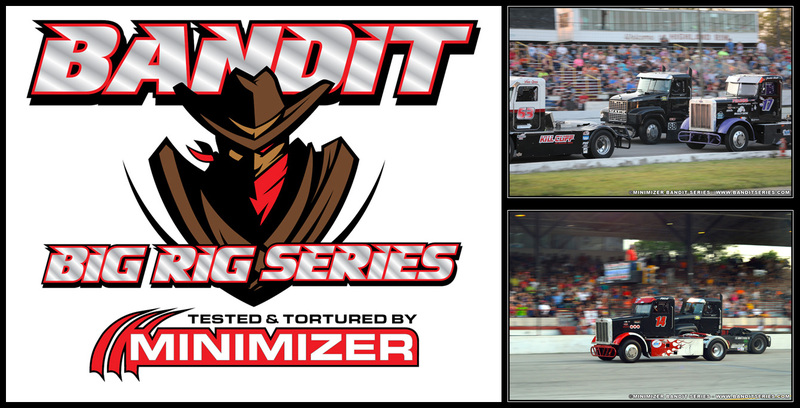 The first Minimizer Bandit Big Rig Series event of 2018 is at Mobile International Speedway on March 10th . Fans that are unable to attend events in person can watch the live stream on the Bandit Facebook page or the Bandit YouTube channel.